University Of Bedfordshire, Amman, Jordan is the first British University in Jordan. Hosted By: Middle East University, Amman, Jordan. 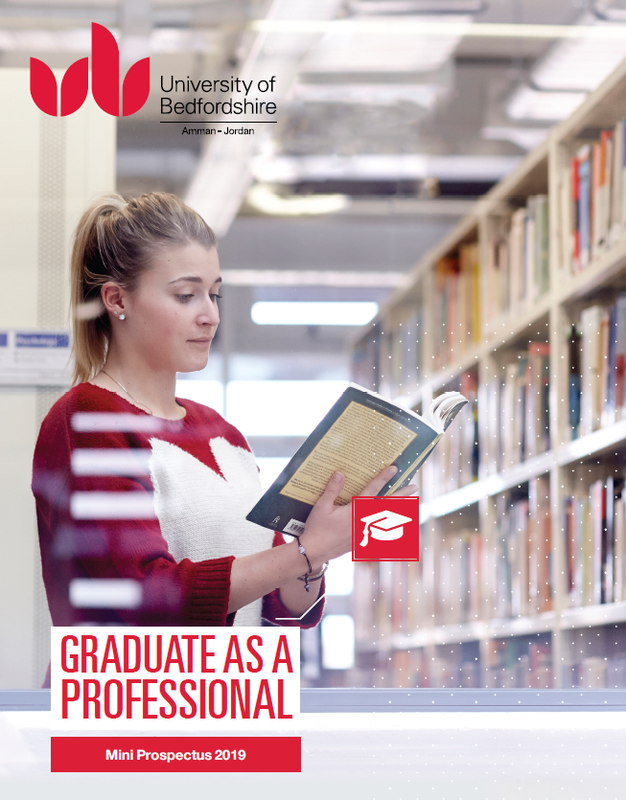 The University of Bedfordshire is a modern, innovative university with a heritage of top quality education going back more than 100 years. We nurture our students to become educated, employable and entrepreneurial global citizens. We support our students in all aspects of their life and encourage them to influence the education and services. With campuses in Luton, Bedford, Milton Keynes and Aylesbury we welcome students of all ages and backgrounds. -More than 20,000 students from over 120 countries -International and multi-cultural learning communities -Education partners in China, Middle East, Europe and South East Asia 92% of Bedfordshire students who graduated last year have found jobs or are in further study – the highest figure achieved by the University. Middle East University (MEU) & University of Bedfordshire (UOB) along with its Global Partner London School of Commerce (LSC) have launched a hosted International Program for Undergraduate and Postgraduate levels. The hosted programs will be offering courses in the fields of Business Administration (Accounting, Finance and Banking, Marketing and International Business), Information Technology (Computer Security and forensics and Cyber Security), Media (Multimedia , Media and Public Relations) and Graphic Design. All degrees are issued from the UOB, UK, approved by the Jordanian Ministry of Higher Education, and the Jordanian Higher Education Accreditation Commission and Scientific Research stamped by the British Council in Jordan. Fill your university experience with memories and powerful connections that will define you as an individual and empower you for a lifetime period. An amazing part of attending a university is the social life. You have got the opportunity to make new lifelong friendships on campus, to enjoy and exercise new and old hobbies and to experience the new atmosphere of MEU. MEU provides a supportive environment for you, so that your life at MEU will be as smooth as possible. We truly understand that for a lot of students, coming to university is a great step and we are here to help you in choosing the most important step in your life, whatever you may need can be hosted! UOB hosted program students will have a medical insurance in Jordan. Also, MEU Medical Clinic is also focusing on student welfare, usually through limited treatment initiatives. MEU dedicated its IAO staff to help and support UOB students in all academic and practical matters. IAO Facebook page is a key forum for current students' Inquiries on campus at MEU, providing information on social activities for students and local events. Moreover, general study guidance for the entire University and specialized study guidance at the different departments. Get involved! MEU clubs' aim is to detect talented students and refine their personality on creativity in the field of volunteerism as well as sports activities. MEU provides individual counseling, group counseling, academic counseling, crisis intervention, and a variety of other services. All students can visit Student Counseling Services Center for assistance with some identifiable concern. Some typical concerns include self-esteem issues, relationships, stress and anxiety, loneliness, depression. MEU offers assessment and psychological evaluation for academic success difficulties and mental health issues. The Center plays an important role of crisis intervention in the university community. Our counselors work closely with the campus security team to protect our students from harm. During the normal office hours, a counselor is always available for walk-in emergency. All services are provided in a confidential and professional atmosphere. Student Counseling Services takes every reasonable precaution to protect the privacy of students. MEU Service Desk provides help and support with students' email accounts, the Student Portal and the wireless internet access around campus. In addition to student support, MEU performs follow-up work and evaluations to facilitate learning about study problems at an early stage, and thereby offer better support.